hi there! it's jillian from cornflake dreams and i was so excited when shelli asked me to participate in her tuesday's turndown series. and then i remembered our itty bitty bedroom (sigh) it is 8ft x9ft and with a queen bed there's not too much room for any other furniture so this post will be short and sweet! my fiance and i have decided to keep the room simple. we painted the main wall a bright blue to serve as an anchor (or headboard, since there is no room for a real one!) i love the pop of color against our patterned dwell studio bedding (i removed the interior down comforter for the summer months). the ledge shelve above our bed has a few photos and light frames (we were both a little nervous about heavy frames falling on us in the middle of the night...anxious much?!) my favorites are the canvas print of the photobooth shots we took right after we got engaged and the rustic "i love you like biscuits and gravy" print. and the leigh viner print on our small bookshelf is a sweet reminder of our upcoming honeymoon to paris! a huge thank you to shelli for having me! 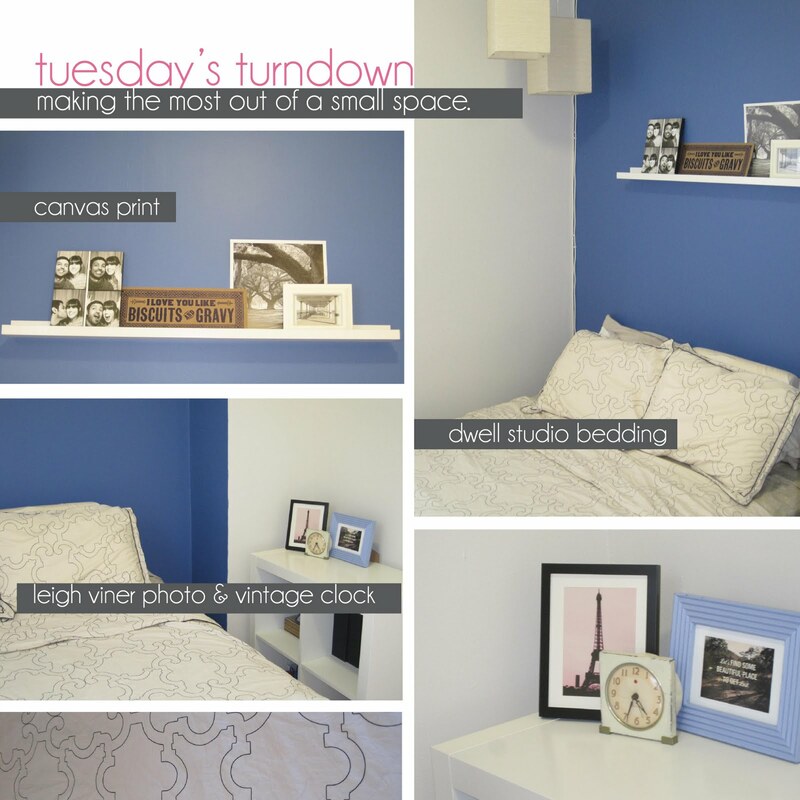 i hope you liked my itty bitty bedroom :) stop by cornflake dreams for a daily dose of fashion, travel and design inspiration. I'm loving your blog. It's so fun, well written and I'm loving seeing all the interiors. Please, drop by if you have a minute. It's so nice to "meet" you! I love the little accents and the color of the wall! 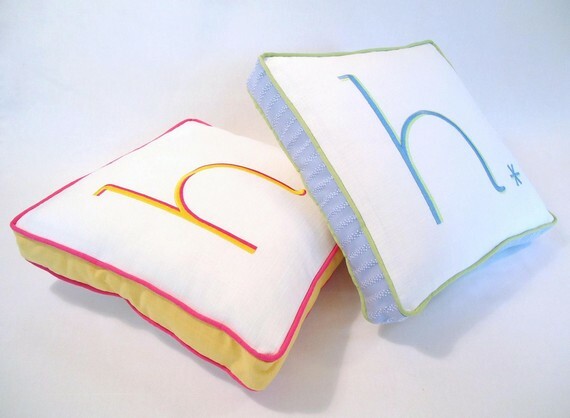 these pillows are so cute! they remind me of the ones that Serena and Lily sell! i love these pillows!! i want one!! btw..i love your chair! it looks really good in your family room! i just "finished" my living room...but, are we EVER finished..no! come check us out! I love Ms. Cornflake...her bedroom is great, and i can't wait to hear all about her Paris trip. when she gets back of course! She's done an amazing job with her bedroom. Love the blue and the Dwell studio bedding. Love the pop of blue on the accent wall!! Love this wall color!! and even the itty bitty bedrooms can feel the most cozy and beautiful! Love the pop of blue on the accent wall, it really adds great punch to such a little space. it's a beautiful room jillian!! Love it! Great blog too! A Word From Stella and Dot...and a deal for you! Gold Espadrille Love- a find. Need amazing custom pillows? I found them! How to give your space a spring spruce up! Protect your FACE! My must have sunscreens! Giveaway! Ikat Scarf from The Zhush! Amber Interiors- Rainbow Brights...add color! Honey Were Home- Fun Decor Finds! Ten June- Home Tour Updates! Danielle Oakey Interiors- Emory's Bedroom! A Thoughtful Place- Festive 4th! Michaela Noelle Designs- Designer Secrets! Annie Sloan Chalk Paint Arrived! New Anthropologie Knobs for a New Look!